Well, after putting up my little contest, I nearly forgot about it! I had a lovely camping trip last weekend, spent some time knitting by the campfire (though of course I didn’t get any pictures of that) and had fun hanging out with my sisters. And ice cream for breakfast, because that’s always important. But, without further ado, the winner of my 5 year Blogiversary contest is…. Thursday / Bex! – please contact me so we can discuss yarn / color / pattern preferences! The winner was chosen using the random.org random number generator, because I was going to ask MJ to pick a number but she wasn’t on IM and then I realized she was one of the entrants. 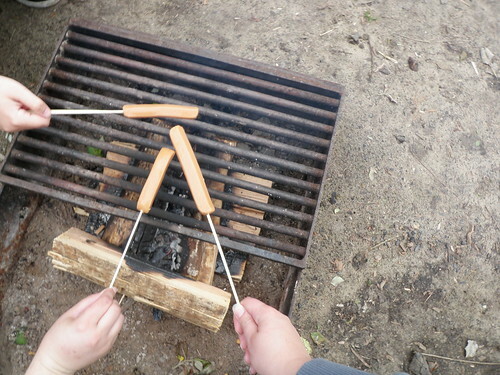 A camping tradition, roasting soy hot dogs over a campfire. Five years ago I started this blog. I was a fairly inexperienced knitter, and had just moved to Boston and discovered the wonders of knitting groups. I’ve come a long way! The blog has gone on more or less that whole time. Some times have been more active than others, and the fact that I pretty much only post finished stuff doesn’t help with that. But I feel pretty accomplished for keeping the blog going for this long. So, in celebration, I’m having a contest. Leave a comment on this post by midnight on Monday September 14th telling me what your favorite thing is that I’ve knit. You can even cheat and look at my Ravelry projects page. I’ll select a random comment and that person will win a pair of socks knit by me. I’ll find out your general yarn and pattern preferences and figure out something fun. I’ll be camping with my sisters this weekend, so I might not be able to approve comments right away, so never fear if you don’t see yours for a while. Congrats to Cathy and Harriet, who won my blog contest! 2. Who is my “boyfriend”? My “boyfriend” is CTHGSY. You haven’t seen him for a while, but I assure you he’s still around. 3. 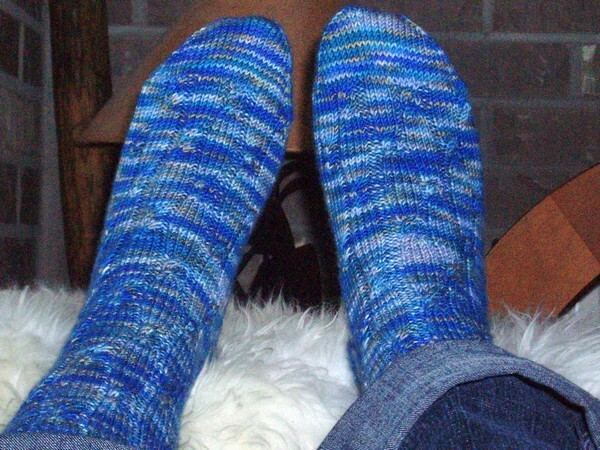 What yarn did I use for my first “human-sized” socks? 4. How many adult sweaters have I knit? The answer for sweaters with sleeves is actually 6, although only 5 of them really made the blog. As for t-shirts / tanks, there are an additional 4. Strangely no one got this question right. 5. Why are my Regia Strato socks famous? I took these socks to New York and knit on them in line for the AFI video premier of Miss Murder. The line (and me knitting the socks) was shown on MTV. 6. What luxury fiber do I dislike? 7. How many times have I moved since starting this blog? Cathy was right on with 6. Actually, I counted wrong the first time and thought it was 7, but recounted and it’s really 6. Winners – please contact me via email (or if I don’t hear from you in the next couple days I’ll try to track you down) so I can figure out a good prize for you. Post 500: A Bloggy Scavenger Hunt! Well, here it is, the 500th post on my blog! 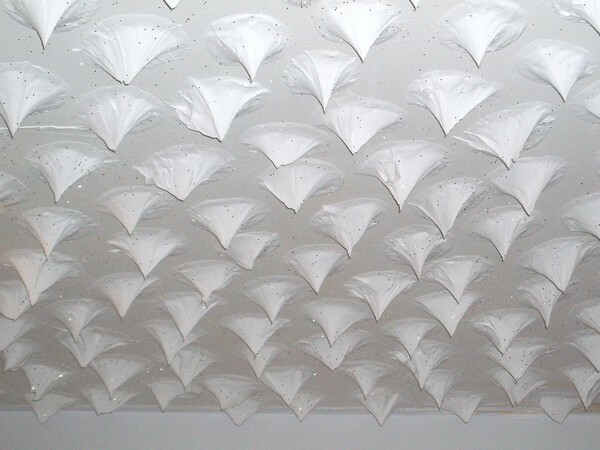 From my humble beginnings in 2004 (really, really humble…. I just went back and read some of them) to the obsession with socks, and now the present. To celebrate I’m having a little blog scavenger hunt. Leave a comment with the answers. Keep in mind, I’ll be leaving these comments screened until the end of the contest, so if you want to say something to the world, make a separate comment. I’ll pick the most correct answers for an as-yet-undetermined prize, and if there’s a tie I’ll draw names. (I promise, it will be nice!) I’ll give you til April 4th, that’s when I get back from Sock Camp. I figured my vacation to the west coast would be the perfect time to clear out some of those sock WIPs. So far I’ve finished two pairs, and I’m a little afraid that I didn’t bring enough! Thankfully there’s a bit of spare yarn as well. The first pair I finished yesterday was the test knit I was working on for MJ. They’re pink and beautiful and I will post again with the pattern info and pictures as soon as it’s available. 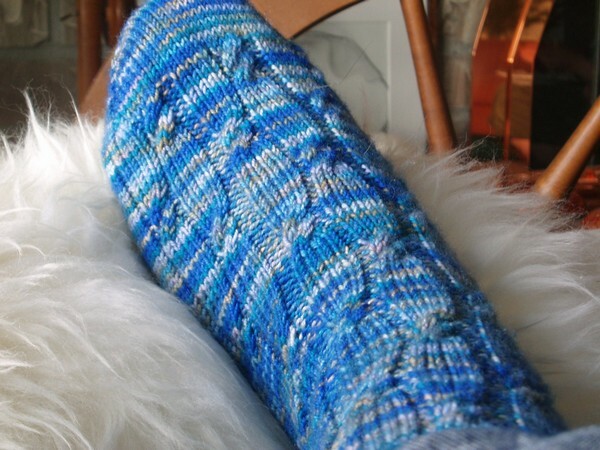 It’s a pretty and simple cable pattern that adds interest to socks but still works with a more variegated yarn. These are one of the prizes for my contest winner Weezalana. It took me a while, but here they are! Now back to that knitting thing so I can finish some more socks! Back to that contest thing…. So remember back when I had the contest? Right, well my sock knitting was not half as fast as most of you predicted, and I now know that the winner will be Cindy who guessed November 15th (the latest guess) – and she won’t even be off by too much. Unfortunately, Cindy is also unidentifiable – so if you’re she could you please contact me? Now, back to the sock knitting news. Actually the second half of my Thanksgiving extravaganza was pretty much knitting-free. I finished up those Monkey socks and cast on for the Ripples sock in Yarn Pirate Plum Gorgeous at the train station. I keep telling myself I’ll have a contest, but then I never do. I was waiting for something significant to happen. Well it has, this is my 300th post! 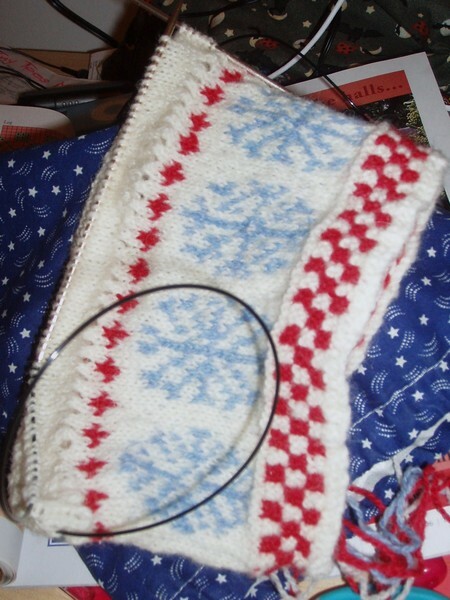 You will guess when I will finish my 100th pair of socks – obviously I don’t yet know the answer, but when the event does occur the person with the closest answer (or a randomly selected winner if more than one person guesses the correct day) will win a pair of socks knit by me! Just leave your guess in the comments with the date that you think I’ll complete my 100th pair of socks. I’ll give the winner a few choices of yarn from my stash, or if they don’t like any of those they are welcome to provide some of their own yarn and I’ll knit it. So get guessing, the deadline for entries is 2/28. My current sock count is at 65 completed pairs as of today, and the sidebar is up to date with all socks in progress.